Here, we share tips and strategies on sticking to your food plan, dealing with stress and successfully surviving the holidays in a healthy way - there’s no better way to start the new year than making progress on what would normally be an upcoming New Year’s Resolution! Oh, those social gatherings… the parties, dinners, cocktail hours, company parties, religious functions, you name it, they happen and come at full speed during the holidays, when we are already at our busiest. For as much as we love them, if unprepared, they can void all the discipline we had on our food plan that week. But wait, there’s good news, you don’t have to let it. If you are hosting the party, it’s all in your control, so plan a smart healthy food and beverage menu and stick to it, you’ll be surprised, your guests will appreciate it. If you are a guest, take a few minutes to mentally prepare for a fun yet successful party food-wise. If a full dinner is served, buffet-style or sit-down, make the smartest selection given choices available. In some cases, special dietary needs can be accommodated so don’t hesitate to inquire ahead of time. If the party you’re attending is cocktails and hors d’oeuvres-based, eat your meal along with plenty of vegetables, raw and cooked, before leaving for the party so you will be full and less likely to be tempted. If tempted, opt for healthier foods, and avoid food tables and pass-trays while staying pleasantly social. And of course, you can still celebrate with a beverage, a program approved beverage is preferred and in your best interest. Being prepared gives you a better chance of success. Let’s face it, even the most disciplined among us will inevitably be somewhere and eat or drink out of their normal routine. It doesn’t have to be a negative thing. Just be prepared, carry food packets, especially convenient ones, along with raw vegetables, hard-boiled eggs, almond butter (if applicable to your plan) and water. Hydrating is so important, but more-so during a stressful season when running our bodies down. Carry water with you everywhere you go if possible, and measure your consumption. Many people find that filling measured containers, such as a gallon, at the beginning of the day, helps them keep track. Others simply keep track by drinking 8, 16 or 24 ounce bottles a certain number of times throughout the day. Others drink a glass or two upon waking, a glass or two before every meal, and a glass at bedtime. Unless you’re meeting this with resistance, it really is easy to drink your 8-10 cups of water per day. Your body deserves the many benefits water provides, especially in times of high stress! I know, you’re busy already. How can you keep to your existing routine or squeeze it in without needing extra time? 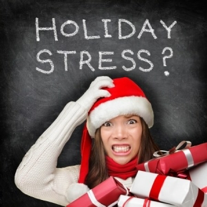 Since exercise is one of the best ways to reduce stress, and with this being the busiest, most stressful time of year, this is when we need it most! If you cannot keep to a normal exercise routine, add a little in here and there - park your car far away from your destination and enjoy the fresh air and brisk walk. Or take a stroll while talking on the phone – it’s amazing how much distance we can get it while on the phone! Another idea would be to incorporate calisthenics, planks, squats, abdominal exercises, jumping jacks and/or yoga upon waking and/or before each meal, the possibilities really are endless! Brisk exercise can be a great coffee replacement too. It’s good for the body, mind and spirit and it’s definitely doable. Slow down, breath and oh, don’t forget that hot cocoa! Take time for you, sit back, take a sip of our new yummy chocolate mint hot cocoa (limited time offer!) and breathe. No, really, breathe, intentionally. Deep cleansing breaths help reduce stress, helps focus the mind and relax the body! Doesn’t that sound good? You’ll be amazed at how it feels – the gift of intentional breathing! Try it! Lastly, as you cross off your to-do lists and watch the snowflakes come down, look up at that open sky and remember that you have caring family, friends and a supportive team of people here at Awaken 180 Weightloss. So, don’t hesitate to check-in if you feel you need a little encouragement, or you’re too frustrated, embarrassed or disappointed – that’s when it’s most important to do so to avoid spiraling. Bottom line, it’s all about you. Make the best choices available to help yourself get closer toward your goals. You deserve it and will feel great about yourself. That’s the absolute best gift you can give yourself, your family and friends this holiday season, the gift of a healthy YOU!